Do you ever feel like you're going so slow or having so many setbacks on something you're almost going backwards? Well that's how I've been feeling the past few weeks. 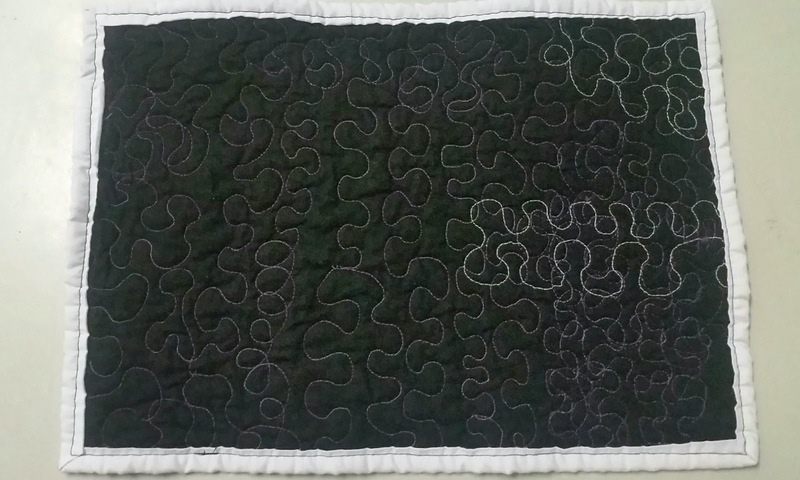 I have a deadline of early next week to finish one of my largest un-bloggable (for now) quilts, and that's pretty much all I've been working on for the last month so apologies for the absence. While I am not able to write much about the actual project (yet), I can use this post to vent some of my frustrations! 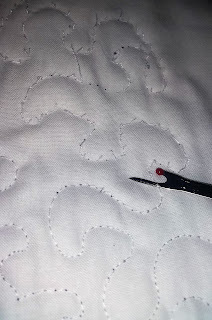 Even though I love my new DIY sewing machine extension table and it's doing the job well, I'm really not enjoying the actual quilting part of making quilts right at the moment. If I could just make quilt tops and have them quilt and bind themselves that would be fabulous! 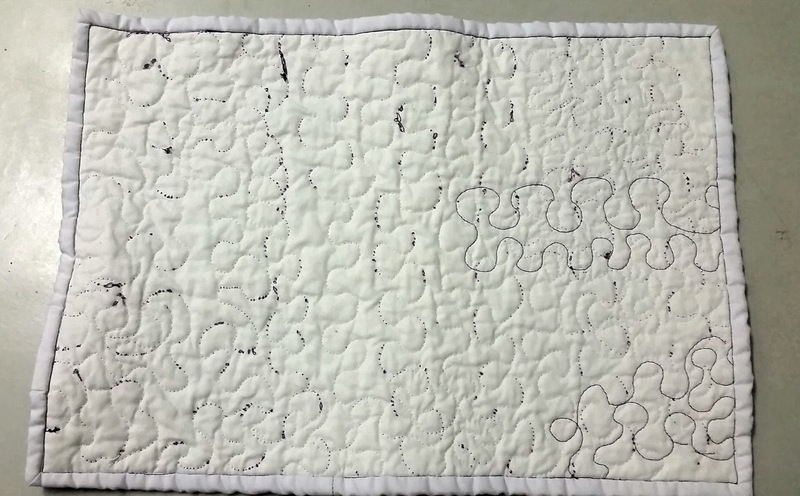 (yes I know I could pay someone to do the quilting for me but I really want to be able to do these things from start to finish all by myself). 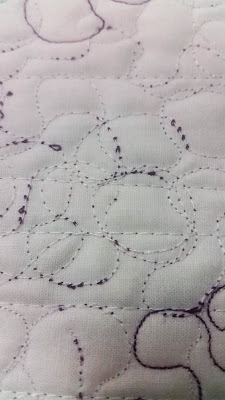 My biggest issues with my current project have been fine-tuning the machine tension settings; and getting that balance between pedal speed and fabric movement under the needle for my free motion quilting just right. And if you were wondering what happens when you don't get those two things right.. 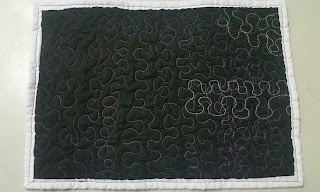 I've put a pic below of the back of one of my practice pieces.. it's really ugly. See the 'eyelashing' on some of the curves? That's because my speeds weren't balanced. 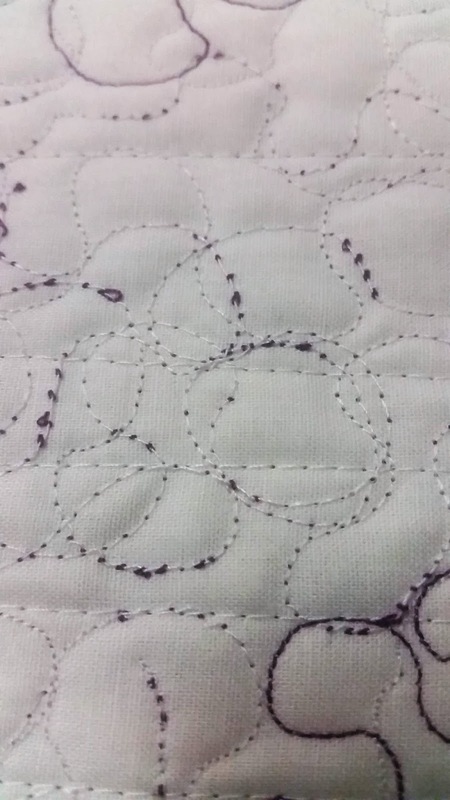 The other pops of darker thread showing through are because the machine tension settings are not right. Of course both the eyelashing and the pops are more noticeable because I have a light coloured thread in the bobbin and a dark thread on the needle for half of this quilt (the other half will be dark top and bottom). It took me days and days, and lots of practice pieces before I got both adjusted to what I thought would be acceptable i.e. 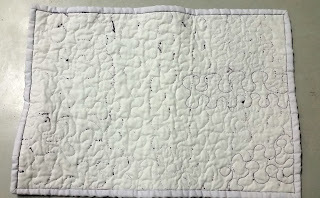 to a point where I thought they were gone or were at least minimal enough to disappear when the finished quilt is washed and everything relaxes, crinkles and fluffs back up. I'm doing Quilt As You Go (QAYG) for this project so I'm quilting individual sections (each about 70 x 11 inches) before joining everything together and then binding it for a finished quilt. Thinking I had overcome my issues with the tension and speed I really got stuck in and proceeded to do the quilting on five of the sections (I think all up there will be 10 or 11 sections in the finished quilt). There was only a little bit of popping and only a couple of really minor little eyelashes so I was pretty happy with that progress. Over the weekend just passed I got the idea that I should probably try washing one of my practice pieces just to confirm that the little inconsistencies would actually be hidden after that process. So that's exactly what I did - I trimmed up one of my practice pieces, bound the edges so it didn't fray and threw it in with my weekly laundry. On one hand I'm really glad that I did, on the other doing it has added to my frustrations and really annoyed me. I didn't expect that the larger mess ups would be hidden, but I had really hoped that some of the smaller ones would be. Nope - they're almost all still highly visible. 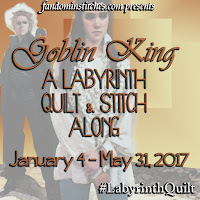 Less than a week until my deadline and I feel like I'm almost starting over with the quilting! But... I'm determined that this quilt will be finished on time and that it will be awesome, so I'm not giving up. I've got two more evenings after tonight, plus Friday off work and the weekend to quilt, assemble, bind and wash/dry this quilt before my deadline of Monday afternoon ... IT WILL GET DONE. Fingers crossed and hoping for all of your positive thoughts to help get me through this.